Foho wine opener is the very useful kitchen tool! It's made of fine zinc alloy and stainless steel material, never rust, not easy to damage. Premium qualityand durability are complemented with ergonomic features that works perfectly for you. - The personalised wine opener can be open beer cover and other soft drinks cap. Foho Premium Wine Opener, you deserve it! HIGH QUALITY MATERIAL -- This Wine Bottle Opener is constructed from zinc alloy for strength and flexibility, corrosion resistance, oxidation resistance, not easy to rust. It's also easy to clean, requires little to no maintenance. ERGONOMIC DESIGN -- The ergonomic "butterfly" design for easy pulling. The curved ergonomic wings with soft touch panels are comfort and easy grip. The classic lever corkscrew requires very little force to remove easily wine corks quickly and efficiently, then avoid damaging corks.The butterfly dual-levered structure makes opening simple and easy. 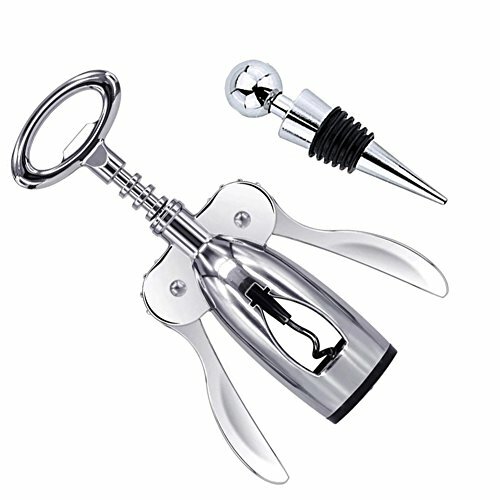 EASY TO USE -- The designed wing style of this corkscrew, makes it easy to grip the unfolding wings while drilling and allows for effective pulling while removing the cork. MULTIFUNCTION AND CONVENIENT -- This corkscrew wine opener pulls double duty as both a beer and wine opener. Ideal for any restaurant, bar, or home for a romantic evening or just a casual drink. OUR PROMISE -- if you are not satisfied with the wine corkscrew, please feel free to contact us and we shall do our best to resolve your problem. We provide best service and best product for you any time.